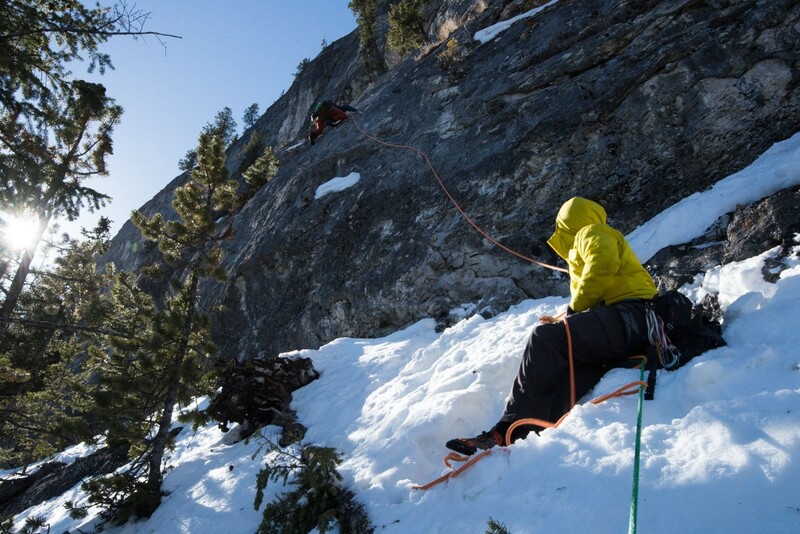 One of the biggest asset the Bow Valley offers to climbers is the ability to rock climb almost year round. The rocky nature of the soil around the valley drains any moisture right away. This feature prevents any seepage on most rock faces, the deciding factor on whether or not you can climb is the sun exposure to the rock face. The rule of thumb is, if the sun's out and the air temperature is +/- 0°C most of the sun facing cliffs will be good to go. Obviously, wind chill and the position of the sun over the horizon will affect this rule. The perfect winter/early spring crag if you can stomach the hike up. The trail will be icy and snow covered lower down in the forest. Echo has definitely become the premier destination for 5.11 and up climbers and for good reason. Early in the season, the trail might be icy early season, plan on bringing trail crampons. I would not recommend going to the Notch area in Echo. This wall sees almost no sun and is best kept for hot July days. I've included Cougar Creek here mostly for early spring climbing on the left hand walls has you walk in the canyon. The steep and narrow nature of this canyon prevents it from being a winter destination. The warmest walls are usually Canadian Fork, Cosmology, House of cards and Crowbar. This Kananaskis crag is a great destination with a relatively short, but steep approach. The cliff sees a lot of late-morning/afternoon sun but keep in mind it can get quite windy. The start of the trail through the trees holds a fair bit of snow so cleats might come in handy. It features a flat and short approach and slab walls that see mid-morning/afternoon sun. This area features a good variety of single and multi pitch’s routes. Be very mindful, there is a lot of terrain above with a potential of rock fall from snow melt. And please be respectful of the 8 p.m to 8 a.m closure happening from March 1st to June 25th to give the animals the space they need to thrive during the spring season. This is a very popular crag because of its very low commitment approach (just go there, you'll see what I mean). It's a great place for a quick session and if you want to make the most of the sun, be there late morning/early afternoon. And keep in mind that there are a lot of trees around the crag so you can find yourself belaying in a bit of snow. The Bowl Area and the East End are steep and hold a lot of heat, making them ideal for early season destinations. Keep in mind that the back side of Yam faces North and therefore holds a lot of snow, plan on rappelling your route. And be careful of falling rocks occuring during the "melts-during-the-day/freezes-at-night" season. If you are new to the area, here is a list of crags that are best kept for summer. Don’t waist your time going there in winter or super early in the spring as it will be in the shades, super cold and most likely seeping cold water: Acéphale, The Notch (Echo), Grassi Lakes, Grotto Canyon, Heart Creek, Lake Louise, the right hand crags in Cougar Creek and Raven’s Crag in Banff. It's always very important to be mindful of potential overhead hazards. Snow melts well above the cliffs and might dislodge rocks, sending them down your way. If this is a potential hazard of the crag you are choosing, pick a steep wall, wear a helmet and stay as close to the wall as possible. Or avoid climbing there altogether until the snow has melted above. With the freeze/thaw cycle, some of the holds might break off and the crags might be more prone to rock fall. Wear a helmet or avoid an area if you suspect potential rock falls! The weather can change dramatically in the mountains, more so in the spring, Pack extra layers, a puffy jacket, gloves and a hat. These will help make your days and belay duties more enjoyable. Wear proper footwear; you might be able to get away wearing flip flops for some approach’s in July however, it will not be the case early spring. Also, be aware that early season is tick season in the Bow Valley. At the end of your day, make sure to check yourself and your partner for ticks, wear light colored clothing so you can see them more easily and try to avoid bushwaking and sitting in tall grass. That being said, enjoy the warm rock in the sun!